Use an upcycled sweater to hand-stich a 4-6" pumpkin for your fall decor. You'll learn simple hand-stitching techniques, including a running stitch, gathering stitch and ladder stitch. You'll also learn how to cut and square fabric using a rotary cutter and mat, and then how to stuff and close a three-dimensional object. 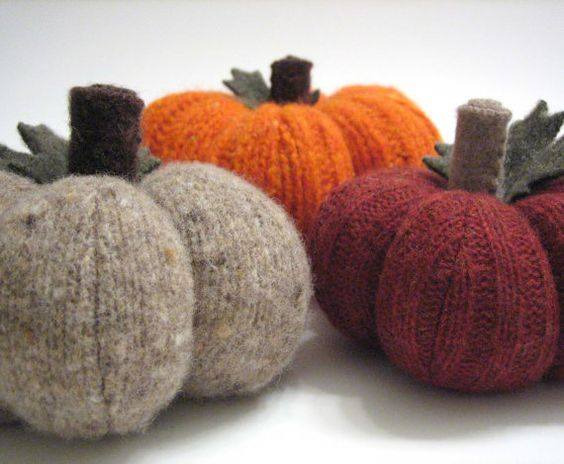 We'll talk about how to make your own felted wool in the washing machine, and you can purchase more materials to make a whole patch of pumpkins at home, if you like. Just $12 to make one pumpkin, with additional supplies available for $5 a kit. Buy your tickets early and save your seat through the link below. Color choices will be orange, grey/tan, green or white with green or brown stems. Sewing skills are not required. Participants should bring a pair of fabric scissors, but we will have scissors to share.